The first settlers inhabited the “Cueva de las Arañas” (the cave of spiders) in the third and fourth Millennium BC. In the first century AC., with the arrival of the Romans, the area became known as “Portus Illicitanus”, developing into one of the key ports for maritime commerce. From this period there are many archaeological remains. After the fall of the Roman Empire, and during the medieval era the area suffered a fall into general decline, largely due to the plundering of Pirates. 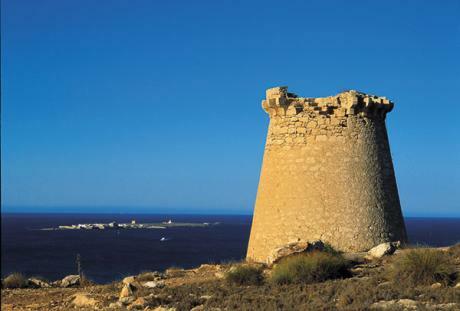 This motivated the building, in the XVI century, of the Castle-Fortress and the “Torres Vigía” (vigilance towers). From the XVIII century onwards the town was concentrated around the Castle, the nucleus from which the development of the settlement evolved. Nowadays, Santa Pola is a tourist municipality with the most important fishing fleet in the Spanish Mediterranean. By taking the A-7 motorway, leaving at exit n72, joining the N-332, direction Cartagena. Or following simply the N-332, direction Cartagena. The El Altet airport is only 10 kilometres away.